Dubai has made its place among world’s top business hubs. Achieving this status is a result of its policies adopted for growth of different types of business activities. The government is ready to provide facilities to big corporations as well as small traders and businessmen alike. Due to support and scope of small business in Dubai, several small businesses are continuously opening and flourishing in Dubai.Small investors are more careful to choose their business as they can’t afford losing their investment. In this scenario, the best option for these small investors is to invest in the food and beverages industry in Dubai. It is because this industry is on continuous rise in Dubai and hasn’t been affected by VAT and other economic issues. You need lot of investment for business like opening restaurant in Dubai. But the most cost-effective and profitable food business in Dubai is opening a coffee shop. There is no doubt that the procedure to open a coffee shop is not only easy but also the most cost-effective among all the food businesses in Dubai. You need a very small place to setup your coffee shop and there are very few commodities required to serve customers in any coffee shop. As compared to hotels and restaurants, the people usually sit for a short amount of time to enjoy coffee and seats are soon available for new coming customers. This simply reduces cost of additional equipment for coffee shop. As compared to start a hotel in Dubai, this is a small business and the requirements for its setting up are also few. You don’t need to submit large number of documents in different departments. The time for approval of your application is also relatively short. But availability of these advantages doesn’t mean setting up your coffee shop has no challenges. In fact, you will face difficult times at least in the beginning due to tough competition and several other factors. 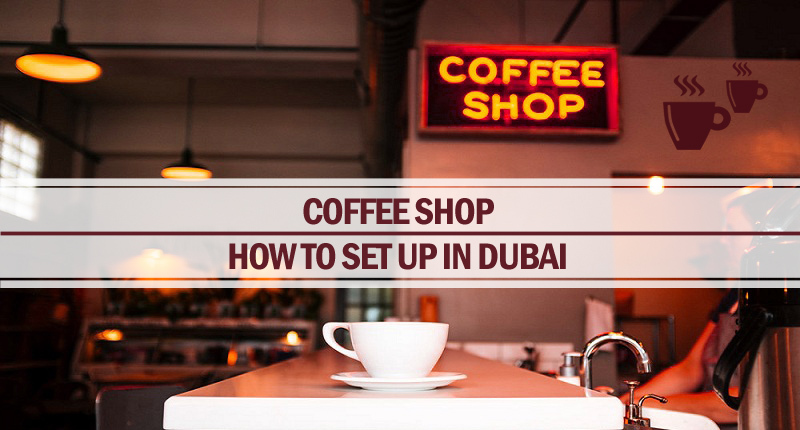 Following are important steps that you can take to minimize your issues related to open a coffee shop in Dubai and maximize the benefits available here for your small business. The most important thing to consider before opening a coffee shop is to select a location according to your investment and requirement. Try to choose a place with high population and less number of coffee shops. Commercial areas are best in this regard due to arrival of large number of customers on regular basis. If the area is expensive and you are having low budget, then try to take a place in the area that is easily accessible through roads or train. Coffee shops can be started in Dubai mainland and several free zones. Both places have their own pros and cons and you need to consider them according to your requirement to choose the place. This is a major step before starting your coffee shop so there is no problem taking time for this. Otherwise, it may prove just losing your money on the business that should be profitable. No matter how important or selective your business place is, you will go to face competition from nearby businesses in Dubai. In this case, the best strategy you can adopt to attract more customers towards your shopping place is by presenting something new and unique that is not available in your nearby shops. These features will make your shop unique and will result in bringing more customers. Just setting up your business in right area and providing required products is not enough to get your business going. You necessarily need a comprehensive marketing plan to reach out to customers not only in your area but also in nearby places. This also relies on your investment. If you want to entertain large number of customers from different areas then you need online marketing, billboard advertisement in Dubai or advertisement in print and electronic media. But most of the coffee shops prefer marketing on smaller scale for local population according to their capacity. In this case, banner ads in nearby places and roads are suitable. Another important thing to note is that advertise your business whenever you are presenting something new for your customers. It will not only increase your customer base for the time being but can assist you to get customers on regular basis. After considering and planning all important issues for growth of your business, you will be required to deal with the most important part of getting right type of license for your coffee shop. Opening coffee shop will require professional license in Dubai. The main license-awarding authority is Dubai Municipality (DM). This license will allow you to sell coffee as well as other small food items for your customers including biscuits, brownies, cakes, pastries, soft drinks etc. You are not allowed to sell meal in your cafeteria and you will require a separate license and permission for this purpose. Submission of various documents in DM and other relevant authorities is mandatory to acquire this coffee shop license in Dubai.